The MINIMAL CHIC collection by Dune, combines the principles of minimalism and the personality of the brand, to create harmonious designs with a touch of distinction and soul. The simplicity of the shapes invites us to play for creating balanced compositions with soft tones. This collection shares many characteristics with the minimalist artistic movement. The designs are constituted either by having the geometry as the central axis, or by allowing the abstraction to play with the materials. The contrasts that come from the combination of softer and darker colours predominate, as well as the use of granules that bring brighter effects and texture to the creations. The pieces, despite their simplicity, do not renounce on becoming protagonists of the rooms because they are unique and different decorative solutions. 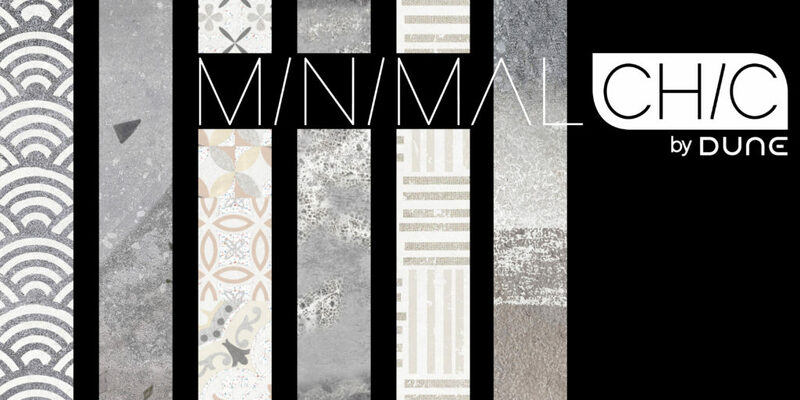 Our design team thoroughly studied the minimalist movement, the historical context, the aspirations of the artists, their works … and soon they became creators that shaped the art into tiles instead of in canvases. Each of them were inspired by an artist and they wanted to honour him by dedicating a decoration piece each. “During my time as a student of Fine Arts, I always felt a predilection for Frank Stella. The use of bright colours and shapes captivated me” says Barbara, designer of the decorated Stella. “Geometric shapes have always been a source of inspiration for me. They allow a great variety of combinations and compositions, and the minimalist artists have been able to work geometry very well” says Yolanda, designer of the Gego decoration. 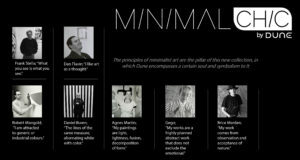 Art becomes the inspiration of this collection that we will show you through our social networks and in future posts where we will know more about each of the masters of minimalism.